"Lemon and basil combine nicely into a pesto topping for steaks." Chop 4 garlic cloves in a food processor until minced. Add the basil and pine nuts, and pulse a few times to combine. With the food processor running, slowly pour in the olive oil, stopping once or twice to scrape down the sides. Place the Parmesan cheese, lemon juice, and red pepper flakes into the food processor, and pulse until blended. Season to taste with salt and pepper. Rub the flat iron steaks with 2 cloves minced garlic, season to taste with salt and pepper, then set aside. Preheat an outdoor grill for medium-high heat and lightly oil grate. Grill the steaks to desired degree of doneness on preheated grill, about 4 minutes per side for medium. 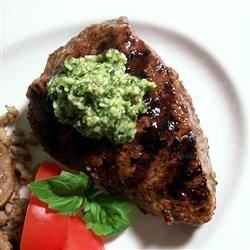 Baste the steaks occasionally with a little of the pesto sauce. Once done, serve topped with the remaining pesto. Very nice twist on pesto! Next time I think I will try it with a dash of chili oil instead of the crushed red pepper flakes. I think it might mix in a little better. I loved this in every way. I don't usually put red pepper flakes in my pesto, but that little bit of heat was great.